The estimated lifetime risk of being diagnosed with lung cancer is 1 in 13 (8%) for males, and 1 in 15 (7%) for females born after 1960 in the UK. These figures take account of the possibility that someone can have more than one diagnosis of lung cancer in their lifetime (‘Adjusted for Multiple Primaries’ (AMP) method). Data is for UK, past and projected cancer incidence and mortality and all-cause mortality rates for those born in 1961, ICD-10 C33-C34. 79% of lung cancer cases in the UK are preventable. a WCRF/AICR classifies evidence on inorganic arsenic in drinking water as convincing. International Agency for Research on Cancer. List of Classifications by cancer sites with sufficient or limited evidence in humans, Volumes 1 to 118. Accessed June 2017.
International Agency for Research on Cancer (IARC) classifies the role of this risk factor in cancer development. 72% of lung cancer cases in the UK are caused by smoking - 71% caused by active smoking, and 1% caused by environmental tobacco smoke (ETS, also called second-hand smoke). An estimated 86% of lung cancer deaths in the UK are causes by tobacco smoking. Lung cancer death risk is around 15 times higher in current smokers compared with never-smokers, a cohort study of British males showed. Lung cancer risk increases with both smoking duration and amount, but duration has the most effect on risk: smoking one pack of cigarettes a day for 40 years is more hazardous than smoking two packs a day for 20 years. [5-7] Lung cancer risk in smokers is higher in those who start smoking at a younger age. [8-10] Lung cancer death risk is 37% higher per five years younger at smoking initiation, a cohort study of women showed. Lung cancer risk is around 26 times higher in men who smoke 15-24 cigarettes per day, compared with never-smokers, a cohort study showed. Lung cancer death risk is around 5 times higher in smokers of 1-4 cigarettes per day, around 12 times higher in smokers of 8-12 cigarettes per day; at least 24 times higher in smokers of 25+ cigarettes per day;[4,14] and 39 times higher in smokers of 42+ cigarettes per day, all compared with never-smokers, cohort studies (some including only women or middle-aged people) have shown. Lung cancer risk is associated with waterpipe tobacco smoking (smoking flavoured tobacco through a long pipe attached to a water bowl), a meta-analysis from mainly African and Asian studies showed; however confounding by cigarette smoking is possible. International Agency for Research on Cancer. List of Classifications by cancer sites with sufficient or limited evidence in humans, Volumes 1 to 117. Accessed January 2017. Calculated by the Statistical Information Team at Cancer Research UK, 2018. Based on Brown KF, Rumgay H, Dunlop C, et al. 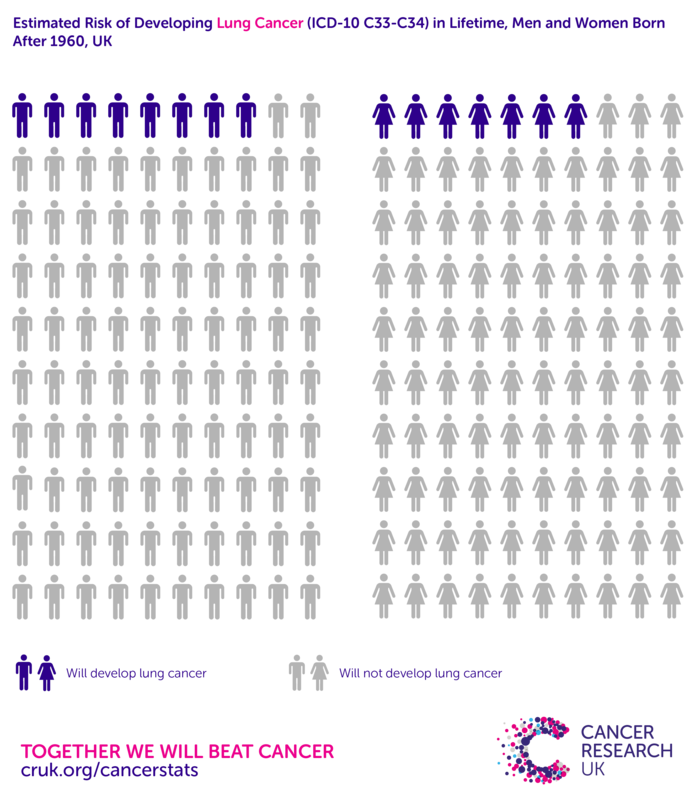 The fraction of cancer attributable to known risk factors in England, Wales, Scotland, Northern Ireland, and the UK overall in 2015. British Journal of Cancer 2018. Peto R, Lopez A, Boreham J, et al. Mortality from smoking in developed countries 1950-2005 (or later). March 2012. Doll R, Peto R, Boreham J, et al. Mortality from cancer in relation to smoking: 50 years observations on British doctors. Br J Cancer 2005;92(3):426-29. Cancer Research UK Statistical Information Team. Calculated using formula in Doll R, Peto R. Cigarette smoking and bronchial carcinoma: dose and time relationships among regular smokers and lifelong non-smokers. J Epidemiol Community Health 1978;32(4):303-13. Lubin JH, Caporaso NE. Cigarette Smoking and Lung Cancer: Modeling Total Exposure and Intensity. Cancer Epidem Biomar 2006;15(3):517-23. Flanders WD, Lally CA, Zhu B-P, et al. Lung Cancer Mortality in Relation to Age, Duration of Smoking, and Daily Cigarette Consumption: Results from Cancer Prevention Study II. Cancer Res 2003;63(19):6556-62. Wiencke JK, Thurston SW, Kelsey KT, et al. Early Age at Smoking Initiation and Tobacco Carcinogen DNA Damage in the Lung. J Natl Cancer I 1999;91(7):614-19. Peto R, Darby S, Deo H, et al. Smoking, smoking cessation, and lung cancer in the UK since 1950: combination of national statistics with two case-control studies. BMJ 2000;321(7257):323-29. Pirie K, Peto R, Reeves GK, et al. The 21st century hazards of smoking and benefits of stopping: a prospective study of one million women in the UK. Lancet 2012. Kenfield SA, Wei EK, Rosner BA, et al. Burden of smoking on cause-specific mortality: application to the Nurses' Health Study. Tob Control 2010;19(3):248-54. Darby S, Hill D, Auvinen A, et al. Radon in homes and risk of lung cancer: collaborative analysis of individual data from 13 European case-control studies. BMJ 2005;330(7485):223. Bjartveit K, Tverdal A. Health consequences of smoking 1-4 cigarettes per day. Tob Control 2005;14(5):315-20. Pope CA, Burnett RT, Turner MC, et al. Lung cancer and cardiovascular disease mortality associated with ambient air pollution and cigarette smoke: shape of the exposure-response relationships. Environ Health Persp 2011;119(11):1616-21. Khuder SA. Effect of cigarette smoking on major histological types of lung cancer: a meta-analysis. Lung Cancer 2001; 31(2-3):139-48. Pesch B, Kendzia B, Gustavsson P, et al. Cigarette smoking and lung cancer--relative risk estimates for the major histological types from a pooled analysis of case-control studies. Int J Cancer 2012;131(5):1210-9. Mamtani R, Cheema S, Sheikh J, et al. Cancer risk in waterpipe smokers: a meta-analysis. Int J Public Health. 2016 Jul 15. Smoking cessation has very significant health benefits, including improved life expectancy, compared with continued smokers - even for long-term smokers, older smokers,[1-3] and smokers who quit after lung cancer diagnosis. Giving up smoking in middle age avoids most of the subsequent risk of lung cancer, cohort studies from around the world show. [1,5-7] In men, 15.9% of those who smoke all their lives die from lung cancer by age 75, compared with 9.9% of those who stop smoking by age 60, 6% of those who stop by age 50, 3% of those who stop by age 40, and 1.7% of those who stop by age 30. In women, 9.5% of those who smoke all their lives die from lung cancer by age 75, compared with 5.3% of those who stop smoking by age 60, and 2.2% of those who stop by age 50. Lung cancer risk, particularly squamous cell carcinoma (SCC) risk, is much lower in ex-smokers compared with current smokers, and the gap widens as time since quitting smoking increases, a meta-analysis showed. Lung cancer risk in ex-smokers who quit around 7 years previously is 43% lower compared with current smokers. Lung cancer risk in ex-smokers who quit around 12 years previously is 72% lower compared with current smokers. Reducing cigarette intake rather than stopping may not be as beneficial: lung cancer risk is similar in heavy smokers (around 16-18 cigarettes per day) who halve their intake, compared with sustained heavy smokers. Gellert C, SchÃ¶ttker B, Brenner H. Smoking and all-cause mortality in older people: Systematic review and meta-analysis. Arch Int Med 2012;172(11):837-44. Parsons A, Daley A, Begh R, et al. Influence of smoking cessation after diagnosis of early stage lung cancer on prognosis: systematic review of observational studies with meta-analysis. BMJ 2010;340. Crispo A, Brennan P, Jockel KH, et al. The cumulative risk of lung cancer among current, ex- and never-smokers in European men. Br J Cancer 2004;91(7):1280-86. Brennan P, Crispo A, Zaridze D, et al. High Cumulative Risk of Lung Cancer Death among Smokers and Nonsmokers in Central and Eastern Europe. Am J Epidemiol 2006;164(12):1233-41. Halpern MT, Gillespie BW, Warner KE. Patterns of Absolute Risk of Lung Cancer Mortality in Former Smokers. J Natl Cancer I 1993;85(6):457-64. Tverdal A, Bjartveit K. Health consequences of reduced daily cigarette consumption. Tob Control 2006;15(6):472-80.
International Agency for Research on Cancer (IARC) classifies the role of this risk factor in cancer development. 1% of lung cancer cases in the UK are caused by environmental tobacco smoke (ETS, also called second-hand smoke). An estimated 15% of lung cancer cases in never-smokers in the UK are linked to ETS. Lung cancer risk in never-smokers is 31% higher in those exposed to environmental tobacco smoke (ETS, also called second-hand smoke) at home or at work, compared with those not exposed to ETS, a meta-analysis showed. Lung cancer risk in non-smokers is doubled in those with the highest workplace ETS exposure levels, versus those not exposed to ETS, a meta-analysis showed. Small cell lung cancer risk in never-smokers is around three times as high in those exposed to ETS, compared with those not exposed to ETS, a meta- analysis showed. Non-small cell lung cancer risk in never-smokers is 28% higher in those exposed to ETS, compared with those not exposed to ETS. Lung adenocarcinoma in situ/minimally invasive adenocarcinoma (AIS/MIA) risk in never-smokers is 45% higher in those exposed to ETS, compared with those not exposed to ETS, a meta-analysis showed. Lung cancer risk is probably not associated with ETS exposure in childhood, a meta-analysis showed. International Agency for Research on Cancer. List of Classifications by cancer sites with sufficient or limited evidence in humans, Volumes 1 to 117. Accessed September 2017. Kim CH, Lee YC, Hung RJ, et al. Exposure to secondhand tobacco smoke and lung cancer by histological type: a pooled analysis of the International Lung Cancer Consortium (ILCCO). Int J Cancer. 2014 Oct 15;135(8):1918-30. Stayner L, Bena J, Sasco AJ, et al. Lung Cancer Risk and Workplace Exposure to Environmental Tobacco Smoke. Am J Public Health 2007;97(3):545-51. Kim CH, Lee YC2, Hung RJ, et al. Secondhand Tobacco Smoke Exposure and Lung Adenocarcinoma In Situ/Minimally Invasive Adenocarcinoma (AIS/MIA). Cancer Epidemiol Biomarkers Prev. 2015 Dec;24(12):1902-6.
International Agency for Research on Cancer (IARC) classifies the role of this risk factor in cancer development. 5% of lung cancer cases in the UK are caused by ionising radiation. An estimated 9% of lung cancer deaths in Europe are linked to indoor radon exposure. Lung cancer risk is 16% higher per 100 becquerel/cubic metre (Bq/m3) increment in usual home radon level, a pooled analysis showed. The average UK home usually contains 20 Bq/m3. The effect of radon exposure on lung cancer risk does not appear to differ between smokers and non-smokers. [3,5] But because smokers’ underlying risk of lung cancer is already much higher, smokers exposed to radon have much higher lung cancer risks than do non-smokers exposed to radon. International Agency for Research on Cancer. List of Classifications by cancer sites with sufficient or limited evidence in humans, Volumes 1 to 119. Accessed September 2017. Health Protection Agency (HPA). UK Radon. Newsletters and Reports. Accessed December 2012. Bräuner EV, Andersen CE, Sørensen M, et al. Residential radon and lung cancer incidence in a Danish cohort. Environ Res 2012;118:130-6.
International Agency for Research on Cancer (IARC) classifies the role of this risk factor in cancer development. 13% of lung cancer cases in the UK are caused by workplace exposures. This reflects the higher risk of lung cancer death in current smokers compared with never-smokers, but indicates that smoking and asbestos have a synergistic (combination effect stronger than sum of independent effects) effect on lung cancer development. [5-8] Age at asbestos exposure may modify the risk, but evidence is unclear, a systematic review showed. An estimated 0.02% of lung cancers in Britain are linked to silica (typically in glass manufacture). Lung cancer risk is 55% higher in men who have ever worked as bricklayers, compared with men who have never done so, a pooled analysis showed; this is probably due to silica exposure. An estimated 0.02% of lung cancers in Britain are linked to occupational exposure to diesel engine exhaust. An estimated 0.01% of lung cancers in Britain are linked to working as a painter. An estimated 0.01% of lung cancers in Britain are linked to TCDD (typically in metal and pesticide production). Lung cancer death risk is 22% higher in pesticide production workers compared with the general population, a meta-analysis showed. An estimated 0.01% of lung cancers in Britain are linked to working in sites of naturally-occurring high radon. An estimated 0.01% of lung cancers in Britain are linked to mineral oil exposure (typically in metalworkers and printworkers). An estimated 0.003% of lung cancers in Britain are linked to arsenic and inorganic arsenic compounds (typically in metal production, pesticide production/use, wood preservation). An estimated 0.001% of lung cancers in Britain are linked to working as a welder. Lung cancer risk is 26% higher in welders compared with the general population, a meta-analysis showed. Lung cancer risk may be higher in rock wool and glass wool production workers (though not end-users), a meta-analysis found; however residual confounding by smoking and asbestos exposure is likely. Lung cancer risk is higher in iron and steel foundry workers, a meta-analysis showed. Brown T, Darnton A, Fortunato L, et al. Occupational cancer in Britain: Respiratory cancer sites: larynx, lung and mesothelioma. Br J Cancer 2012;107(S1):S56-S70. McCormack V, Peto J, Byrnes G, et al. Estimating the asbestos-related lung cancer burden from mesothelioma mortality. Br J Cancer 2012;106(3):575-84. Frost G, Darnton A, Harding A-H. The Effect of Smoking on the Risk of Lung Cancer Mortality for Asbestos Workers in Great Britain (1971–2005). Ann Occup Hyg 2011;55(3):239-47.
International Agency for Research on Cancer (IARC). IARC Monographs on the Evaluation of Carcinogenic Risks to Humans. Volume 83 (2004): Tobacco Smoke and Involuntary Smoking. France: IARC, 2004. Erren TC, Jacobsen M, Piekarski C. Synergy between asbestos and smoking on lung cancer risks. Epidemiology 1999;10(4):405-11. Lee PN. Relation between exposure to asbestos and smoking jointly and the risk of lung cancer. Occup Environ Med 2001;58(3):145-53. Kang D, Myung MS, Kim YK, et al. Systematic Review of the Effects of Asbestos Exposure on the Risk of Cancer between Children and Adults. Ann Occup Environ Med 2013;25(1):10. Rake C, Gilham C, Hatch J, et al. Occupational, domestic and environmental mesothelioma risks in the British population: a case-control study. Br J Cancer 2009;100(7):1175-83. Tan E, Warren N, Darnton AJ, et al. Projection of mesothelioma mortality in Britain using Bayesian methods. Br J Cancer 2010;103(3):430-36. Consonni D, De Matteis S, Pesatori AC, et al. Lung cancer risk among bricklayers in a pooled analysis of case-control studies. Int J Cancer 2015;136(2):360-71. Pelucchi C, Pira E, Piolatto G, et al. Occupational silica exposure and lung cancer risk: a review of epidemiological studies 1996–2005. Ann Oncol 2006;17(7):1039-50. Erren TC, Morfeld P, Glende CB, et al. Meta-analyses of published epidemiological studies, 1979-2006, point to open causal questions in silica-silicosis-lung cancer research. Med Lav 2011;102(4):321-35. Lipsett M, Campleman S. Occupational exposure to diesel exhaust and lung cancer: a meta-analysis. Am J Public Health. 1999 Jul;89(7):1009-17. Tsoi CT, Tse LA. Professional drivers and lung cancer: a systematic review and meta-analysis. Occup Environ Med 2012. Sun Y, Bochmann F, Nold A, et al. Diesel exhaust exposure and the risk of lung cancer-a review of the epidemiological evidence. Int J Environ Res Public Health 2014;11(2):1312-40.
International Agency for Research on Cancer (IARC). IARC Monographs on the Evaluation of Carcinogenic Risks to Humans. Volume 105: Diesel and gasoline engine exhausts and some nitroarenes . France: IARC, 2012. Bachand A, Mundt KA, Mundt DJ, et al. Meta-analyses of occupational exposure as a painter and lung and bladder cancer morbidity and mortality 1950–2008. Crit Rev Toxicol 2010;40(2):101-25. Guha N, Merletti F, Steenland NK, et al. Lung cancer risk in painters: a meta-analysis. Environ Health Perspect. 2010 Mar;118(3):303-12. Chen R, Seaton A. A meta-analysis of painting exposure and cancer mortality. Cancer Detect Prev 1998;22(6):533-39. Jones DR, Sutton AJ, Abrams KR, et al. Systematic review and meta-analysis of mortality in crop protection product manufacturing workers. Occup Environ Med 2009;66(1):7-15. Hertz-Picciotto I, Smith AH, et al. Synergism between occupational arsenic exposure and smoking in the induction of lung cancer. Epidemiology 1992;3(1):23-31. Putila JJ, Guo NL. Association of Arsenic Exposure with Lung Cancer Incidence Rates in the United States. PLoS ONE 2011;6(10):e25886. Ambroise D, Wild P, Moulin JJ. Update of a meta-analysis on lung cancer and welding. Scand J Work Environ Hea 2006;32(1):22-31. Lipworth L, La Vecchia C, Bosetti C, et al. Occupational exposure to rock wool and glass wool and risk of cancers of the lung and the head and neck: a systematic review and meta-analysis. J Occup Environ Med 2009;51(9):1075-87. Rota M, Bosetti C, Boccia S, et al. Occupational exposures to polycyclic aromatic hydrocarbons and respiratory and urinary tract cancers: an updated systematic review and a meta-analysis to 2014. Arch Toxicol 2014;88(8):1479-90. 8% of lung cancer cases in the UK are caused by air pollution. Lung adenocarcinoma risk is 40% higher per 10µg/m3 of PM2.5 air pollution, a meta-analysis showed. Lung adenocarcinoma risk is 29% higher per 10µg/m3 of PM10 air pollution. Lung cancer risk overall is associated only with PM2.5 (9% higher risk per 10µg/m3); the association with PM10 is not significant (95% CI 1.00-1.17). Lung adenocarcinoma is less closely linked with smoking compared with other lung cancer types. Lung cancer death risk is higher in people living near major roads, a meta-analysis showed. Though most evidence linking lung cancer risk with diesel exhaust emissions comes from studies of highly-exposed workers, IARC states diesel exhaust may increase lung cancer risk in the general public. Lung cancer risk is around doubled in people who use coal in the home for cooking or heating, meta-analyses (primarily from China and Taiwan, where coals may be more harmful than those used in the UK) have shown. [6,7] Lung cancer risk is not associated with domestic coal use, a European case-control study showed. Hamra GB, Guha N, Cohen A, et al. Outdoor particulate matter exposure and lung cancer: a systematic review and meta-analysis.. Environ Health Perspect 2014;122(9):906-11. Chen H, Goldberg MS, Villeneuve PJ. A systematic review of the relation between long-term exposure to ambient air pollution and chronic diseases. Rev Environ Health 2008;23(4):243-97.
International Agency for Research on Cancer (IARC). IARC Monographs on the Evaluation of Carcinogenic Risks to Humans. Volume 105: Diesel and gasoline engine exhausts and some nitroarenes. France: IARC, 2012. Hosgood HD, Wei H, Sapkota A, et al. Household coal use and lung cancer: systematic review and meta-analysis of case–control studies, with an emphasis on geographic variation. Int J Epidemiol 2011;40(3):719-28. Kurmi OP, Arya PH, Lam KBH, et al. Lung cancer risk of solid fuel smoke exposure: a systematic review and meta-analysis. Eur Respir J 2012. Lissowska J, Bardin-Mikolajczak A, Fletcher T, et al. Lung Cancer and Indoor Pollution from Heating and Cooking with Solid Fuels: the IARC international multicentre case-control study in Eastern/Central Europe and the United Kingdom. Am J Epidemiol 2005;162(4):326-33. Lung cancer risk is 82% higher in people whose sibling has/had lung cancer, and 25-37% higher in people whose parent has/had the disease, a meta-analysis showed. The association is independent of smoking. Coté ML, Liu M, Bonassi S, et al. Increased risk of lung cancer in individuals with a family history of the disease: A pooled analysis from the International Lung Cancer Consortium. Eur J Cancer 2012;48(13):1957-68. Chronic obstructive pulmonary disease (COPD) is a collection of smoking-related lung diseases including emphysema, chronic bronchitis, and chronic obstructive airways disease. Brenner DR, McLaughlin JR, Hung RJ. Previous Lung Diseases and Lung Cancer Risk: A Systematic Review and Meta-Analysis. PLoS ONE 2011;6(3):e17479. Brenner DR, Boffetta P, Duell EJ, et al. Previous lung diseases and lung cancer risk: a pooled analysis from the International Lung Cancer Consortium. Am J Epidemiol 2012; 176(7):573-85. Denholm R, Schüz J, Straif K, et al. Is previous respiratory disease a risk factor for lung cancer? Am J Respir Crit Care Med 2014;190(5):549-59. Ibrahim EM, Kazkaz GA, Abouelkhair KM et al. Increased risk of second lung cancer in Hodgkin's lymphoma survivors: a meta-analysis. Lung 2013; 191(1):117-34). Zhan P, Suo L-j, Qian Q, et al. Chlamydia pneumoniae infection and lung cancer risk: A meta-analysis. Eur J Cancer 2011;47(5):742-47. Lin TY, Huang WY, Lin JC, et al. Increased Lung Cancer Risk Among Patients with Pneumococcal Pneumonia: A Nationwide Population-Based Cohort Study. Lung 2013.